Some significant changes for bus riders begin Sunday and Monday, including a new Front Royal commuter bus, an overhaul of DC Circulator routes, and changes for a number of Metrobus services across the region. WASHINGTON – Some significant changes for bus riders begin Sunday and Monday, including a new Front Royal commuter bus, an overhaul of DC Circulator routes, and changes for a number of Metrobus services across the region. As part of the Interstate 66 toll lane construction project, a new commuter bus starts Monday morning from the Front Royal (I-66 and U.S. 340) and Linden (I-66 and Va. 647) Park & Rides to downtown D.C. This is the first commuter bus from that area to the District. It costs $25 for one day, or $440 per month, and has free WiFi, power charging stations and water. The bus is scheduled to leave Front Royal at 4:45 a.m. each day, reaching Metro Center at 6:35 a.m. In the future, the bus is also expected to stop in Crystal City and L’Enfant Plaza. In the afternoon, the bus is scheduled to leave Metro Center at 4:10 p.m. and L’Enfant Plaza at 4:25 p.m., arriving at the Linden Park & Ride at 6 p.m. and the Front Royal Park & Ride 15 minutes later. Metrobus changes on 54 routes across the region include significant changes in parts of Northeast and Southeast D.C., along Columbia Pike in Arlington and in parts of Maryland as well. In Rosslyn, a long-awaited bus tunnel through a newly constructed building opens Sunday, which will speed up bus trips and should reduce traffic congestion in the area. Along Columbia Pike in Arlington, the first part of the additional bus service that was promised after Arlington County cancelled its planned Columbia Pike streetcar is set to begin. Route 16A will now run between Annandale and the Pentagon seven days a week. A new Route 16C will run between Culmore and the Pentagon, with every second rush-hour trip extended to Federal Triangle. Routes 16A and 16C will be limited-stop routes along Columbia Pike, and all stops along Army Navy Drive and Joyce St. Route 16C replaces the old Route 16X MetroExtra limited-stop bus. Routes 16E, 16G and 16H will serve all stops. Routes 16G, 16H and 16K Columbia Heights West/Arlington Mill-Pentagon City lines will have more trips, and Route 16H will replace Route 16J and 16P service in Skyline seven days a week. Route 16K trips will instead be labelled Route 16G. Route 16E will run seven days a week between Culmore and Franklin Square via Pentagon City and the Pentagon after 10 p.m. on weekdays and before 8 a.m. and after 10 p.m. on weekends. There will no longer be buses labeled 16B, 16J or 16P. There are no changes to routes 16L or 16Y. Limited-stop Route 79 between Silver Spring and downtown D.C. will no longer allow riders to pay with cash or to add value to SmarTrip cards onboard. Route 70, a parallel route, will have some adjusted trip times and feature a more concerted effort to consistently space the time between buses running between Archives and Silver Spring. Several DC Circulator routes are completely revamped starting Sunday. The Union Station-Navy Yard Metro route and the Potomac Avenue-Skyland route are cancelled. Instead, new routes run between Eastern Market and L’Enfant Plaza via Barracks Row, Navy Yard and Waterfront and between Congress Heights and Union Station via Barracks Row. Metrobus Route 94 is cancelled, replaced by the new DC Circulator service at some stops between Anacostia and Congress Heights. Some Metrobus service is available in areas where Circulator service was cancelled. Each of the new Circulator routes is scheduled to run 6 a.m. to 9 p.m. weekdays and 7 a.m. to 9 p.m. on weekends. The Georgetown-Union Station route will continue. 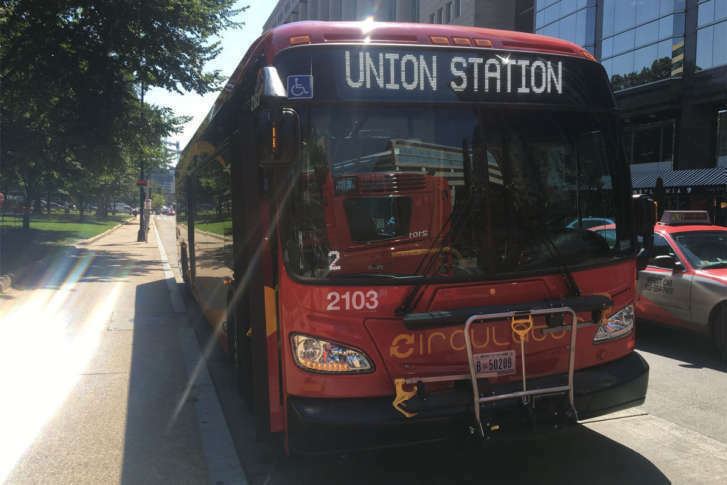 On that route, buses will continue to run only between McPherson Square and Union Station from 9 p.m. to 3 a.m. Friday and Saturday in addition to regular service during hours other Circulator buses are running. There are no significant changes to the Dupont Circle-Georgetown-Rosslyn route, Woodley Park-Adams Morgan-McPherson Square route or National Mall route either. The DC Circulator is ending use of its own paper bus passes this weekend. Passes already sold are only valid through the end of September. Loudoun County Transit bus changes begin in a few weeks. Starting July 2, Route 83 is cancelled, a new Route 985 connects Sterling Park to Wiehle-Reston East Metro, and there are some routing changes around One Loudoun. Starting July 16, Route 88X will have new service to Stone Ridge Park and Ride and Stone Springs Hospital; Route 87X will have less-frequent service; Route 815 will be cancelled; the Christian Fellowship Church Park and Ride Lot will be closed, and there will be a number of other changes. Buses that currently go to the Christian Fellowship Church lot will be split with some going to Loudoun Station and others Dulles North Transit Center. Starting July 23, Loudoun County Transit plans a fare increase for commuter bus riders of $1 per trip to $10 with a SmarTrip or $11 cash. Metrobus J1, J2, J3 Bethesda-Silver Spring – Route J3 is cancelled. Some additional trips will run on Route J2. Route J1 is extended to run between Montgomery Mall and Silver Spring, including Medical Center Metro Station. Route J1 will operate only westbound toward Montgomery Mall in the morning and eastbound toward Silver Spring in the afternoon. Metrobus K12, K13 Forestville – Changes to routing, replacement along Donnell Drive, Marlboro Pike and Forestville Road serving Suitland Metro. Metrobus B30 Greenbelt-BWI Thurgood Marshall Airport – All trips will now stop at Arundel Mills Mall. Metrobus C2, C4 Greenbelt-Twinbrook – Schedule will be extended to reflect regular delays. Slightly more C2 trips will run on Sundays. Metrobus G12, G14 Greenbelt-New Carrollton – Departures to be evenly spaced from end of lines, the two routes will no longer be timed to meet at Roosevelt Center. Metrobus J12 Marlboro Pike – Service is reduced at all times. Metrobus 4A, 4B Arlington Boulevard-Pershing Drive – Route 4A is cut back to only run during rush hours. Some of those trips that had been running at other times will be converted to 4B trips. Metrobus 7A, 7F, 7Y Lincolnia-North Fairlington – The routing of 7A and 7F buses in Pentagon City will change on weekends. On weekdays and evenings, schedules are being extended to reflect regular traffic delays. Metrobus 10E, 10N Alexandria-Pentagon – Route 10E service to and from Rosslyn is being cancelled. Metro suggests riders to Rosslyn transfer from the 10N to the Blue Line at Pentagon. Route 10N’s schedule is being extended to reflect regular delays. A Sunday morning 10N trip will also leave 20 minutes earlier from the Pentagon and Reagan National Airport. Metrobus 22A, 22B Barcroft-South Fairlington – Route 22A will have a slightly different route in Pentagon City at all times outside of rush hour. Route 22B will no longer exist. Metroway – A new southbound stop is added on First St. near N. Fayette St. in Alexandria. Arlington’s ART 54, 92 – Routes cancelled. ART 54 between Dominion Hills and East Falls Church alternatives a bit farther away include Metrobus 1A, 1B and 2A. Arlington suggests walking or Capital Bikeshare as alternatives to the ART 92 Pentagon-Crystal City-Long Bridge Park route. Metrobus 64 Fort Totten-Petworth – Changed route near U Street Metro. Will use Florida Ave. and Vermont Ave. NW between S St. and Florida Ave. to directly serve the Metro station before returning to 11th St.
Metrobus X2, X9 Benning Road-H Street – Route X9 limited-stop service added midday on weekdays to run every 15 minutes Metro Center-Minnesota Ave.
Route X2 — Service is reduced in midday from every 10 minutes to every 12 minutes. All midday X2 trips to run Minnesota Avenue-Lafayette Square. Metrobus D8 Washington Hospital Center and Metrobus G8 Rhode Island Avenue – Long-term northbound detour around closure of 4th St. NE. Metrobus U5, U6 Mayfair-Marshall Heights; U7 Deanwood-Minnesota Avenue – Routes U5 and U6 will now operate between Minnesota Ave. Metro and Marshall Heights/Lincoln Heights. Route U7 will be extended to Mayfair and Parkside, with additional stop outside of rush hour and on Saturdays at Minnesota Ave. and Ridge Rd. SE. Metrobus U8 Benning Heights – Some service extended to Congress Heights as Route V7. Existing service to be renamed Route V8. Metrobus W4 Deanwood-Alabama Avenue – Existing trips renamed Route V7, with slightly different routing. New V7 to provide more frequent service than old independent U8, W4 routes. Metrobus V5 Fairfax Village-L’Enfant Plaza, Metrobus W9 South Capitol Street Limited – Routes cancelled. Metrobus Route 80 North Capitol Street – Two afternoon trips are being added to balance the equity effects of the new G9 limited-stop Rhode Island Avenue bus service. The G9 service is officially becoming permanent after beginning as a test program. Metrobus D5 MacArthur Boulevard-Georgetown – Route will shift around Farragut Square. Metrobus D4 Ivy City-Franklin Square and Metrobus E2 Ivy City-Fort Totten – End of route will shift to Okie Street instead of New York Avenue Northeast.